Earlier this week, friends of ours, who we don't see very often, came for supper. They were asking us about our Greece trip from 5 years ago. So I asked them over for supper and we went over our trip itinery, what we liked, what we didn't like etc. So Mert BBQ'd I made dessert. I thought about doing a cheesecake or a pie or creme brulle, or creme caramel, (I've always wanted to make creme brulle or creme caramel, but havn't done it yet) but I decided on making the simple little pizzelles that we fill with ice cream... and then put strawberries with chocolate sauce on the side. 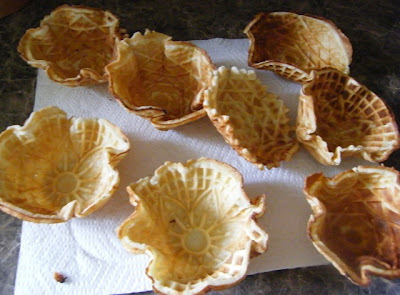 I was telling this to a couple of my quilting friends while we were driving back from Minto earlier in the week, and they didn't know what a pizzelle was, so here is a few pictures to see what it is. My recipe makes 10... but the first one went limp as I opened the pizzeller prematurely... and the second one, was a little to dark.... so that means for my dinner I got to pick the best 4 from the 8. I think I'll save the other 4 in the freezer for another day. Want the recipe for Pizzelles. This is the one I use from Martha Stewart's website. I make the chocolate ones sometimes too. 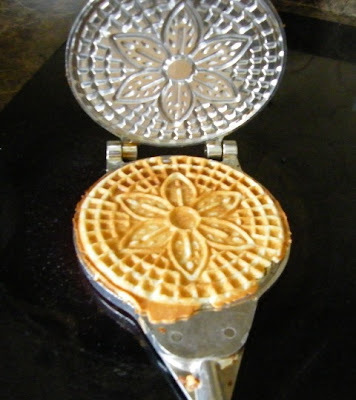 Note Added: To get the right form, I draped the warm pizzelle over a small dish to get the rounded effect. My guests loved the desserts, in fact, they were scraping up the drips of chocolate syrup with their spoons... I was thinking, they better not pick up the dish and lick it.. like on the tv commercial... that would be so bad!! Well, did they love it!!!! how pretty, what do you put them on to shape them?